The Marshall Thundering Herd and the South Florida Bulls meet for the first time ever on Thursday night at Raymond James Stadium. 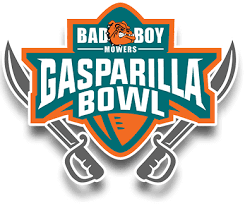 They will be participants in the 2018 Bad Boy Motors Gasparilla Bowl in Tampa, Florida. TV: 8 p.m. ET, ESPN. LINE: Marshall -4; O/U: 51. South Florida hopes to lose the sting of a five-game losing streak that ended the regular season. The Bulls started the season with seven consecutive victories and had visions of a major bowl game. Then injury issues set in along with a leaky defense. A defense that allowed 39.6 points per game led to five double-digit setbacks. Marshall won three straight games to seal its fifth bowl appearance in six years. They ended the regular season with a 41-20 loss at Virginia Tech. The Bulls go for its sixth win in seven bowl games. They beat Texas Tech and South Carolina in the Birmingham Bowl the last two years. The Thundering Herd have won six bowl games in a row, including a 31-28 triumph against Colorado State in the 2017 New Mexico Bowl. The Bulls, who are 6-3 overall in bowls, started that run with a 41-14 victory over Memphis in the St. Petersburg Bowl in 2008. Marshall won the Beef O’Brady’s Bowl in 2011 and the St. Petersburg Bowl in 2015. South Florida hopes to have a healthier offense after a four-week break. They needed it following the 38-10 loss to No. 7 Central Florida on Nov. 23. The Bulls averaged 35.6 points during their 7-0 start, will face a defense that allowed 22 points per game. The Herd D tied for sixth in the nation with 39 sacks. South Florida did’t have No. 1 quarterback Blake Barnett in two of its last three games because of a shoulder injury. He may return, but the Bulls will have a new play caller after offensive coordinator Sterlin Gilbert was hired as McNeese State’s new coach. Marshall is permitting 103.9 rushing yards per game. Senior linebacker Chase Hancock leads the way with 98 tackles. Lineman Ty Tyler boasts a team-best eight sacks and 11 players have an interception. Marshall was 8-4 and 6-2 in Conference USA. Quarterback Isaiah Green had a solid first year at the helm. He threw for 2,238 yards with 15 touchdowns and 10 interceptions. He only completed 55.7 percent of his passes. Tyler King rushed for 655 yards in the first seven games, but has been out the last five with an undisclosed injury. Brenden Knox picked up the slack with 485 in the last four games. He had 204 against Virginia Tech. Wide receiver Tyre Brady is a Conference USA first-team pick and is the top target for Green He hauled in 66 passes for 914 yards and nine touchdowns this year. South Florida was 7-5 on the season and 3-5 in the American Athletic Conference. Barnett threw for 2,498 yards in 10 games. He had 11 interceptions to go along with 11 touchdown passes. Chris Oladokun or Brett Kean would step in if the former Alabama quarterback can’t go. Jordan Cronkrite has rushed for 1,095 yards. That is sixth most in a season at South Florida. The top receiving targets are wideout Tyre McCants. He had 58 catches for 612 yards, and three TD’s. Tight end Mitchell Wilcox had 40 receptions for 506 yards, and two TD’s. Linebacker Khalid McGee leads the beleaguered Bulls’ defense with 104 tackles. Get up to a $1,000 Bonus From the Worlds First Online Sportsbook — Intertops! !